In this quick recipe, flounder fillets are topped with soy sauce, minced garlic, lemon juice, salt and sugar and then baked until flaky. If you love fish and are trying to avoid fried food, then this dish is for you! Serve it with a tasty salad and you have a delicious and nutritious meal in no time. RecipeSavants.com In this quick recipe, flounder fillets are topped with soy sauce, minced garlic, lemon juice, salt and sugar and then baked until flaky. If you love fish and are trying to avoid fried food, then this dish is for you! Serve it with a tasty salad and you have a delicious and nutritious meal in no time. 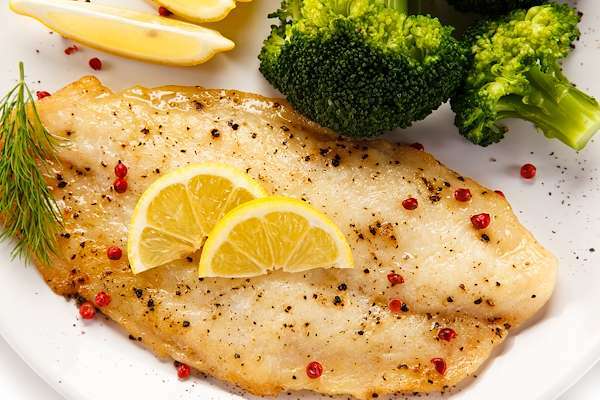 Smart Recipes, American Recipes, Fish Recipes, Recipes Fish American Baked Lemon-Soy Flounder PT15M Serves 4 Ingredients: 4 Medium Flounder Fillets 0.5 Teaspoon Sea Salt & Freshly Ground Pink Pepper 2 Cloves Garlic 1 Tablespoon Soy Sauce 0.25 Cup Olive Oil 1 Large Lemon 1 Teaspoon Sugar Preheat oven to 450 degrees. Meanwhile, in a small bowl combine minced garlic, soy sauce, lemon juice and zest, granulated sugar, and salt & pepper. Whisk in the olive oil until well combined. Arrange the fish fillets on a large sheet pan lined with a lightly greased sheet of parchment paper. Coat the fish with a generous amount of the vinaigrette and allow to rest for 15 minutes. Bake for about 5 to 7 minutes, or until the fish is opaque. Garnish with a sprinkle of freshly cracked pink pepper and a slice of lemon.